Healthsat-2 is a commercial digital Store and Forward satellite for medical communications. It was launched on the 25th September 1993, and joined HealthSat-1 (UoSAT-3) as the second SSTL microsatellite in the HealthNet global communications system of SatelLife, a U.S. non-profit organization. HealthNet, which is licenced in eighteen countries in Africa and Latin America, is providing desperately needed low cost 'last mile' communication links between medical institutions and health programmes in the developing world. 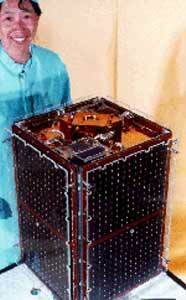 The HealthSat-2 mission was completed from concept to launch within one year. SSTL was responsible for the design, construction test and in-orbit commissioning of the satellite from its facilities in the Centre for Satellite Engineering at the University of Surrey. SSTL were also responsible for all the programmatic aspects of the mission including procuring the launch slot on the Ariane ASAP and arranging suitable insurance for the launch and early commissioning phase - all within a total contract price of 1M pounds Stirling. HealthSat-2 has been custom-designed to support cost effective digital Store and Forward communications using low cost, portable ground stations and this is reflected in the specifications. Under a unique partnership agreement between Wavix, SatelLife, and VITA, the satellite under the name WavSat-1 continues its humanitarian mission.